This tarot meditation on the Temperance card reversed focuses on what happens when we lose our sense of equity. When our own internal struggles make us incapable of seeing the balance in life, and the struggles of others clearly. As you set up your work area, the red cloth laid before you and the candle at its peak, lay the card inverted in front of you. As you begin your meditation, feel the strain of conflict, the suspicion that makes you question the acts of all others, of everyone. 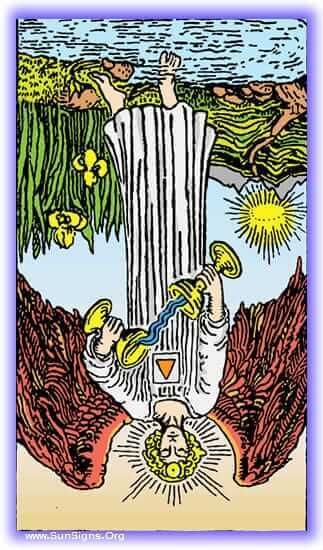 For the time being, embrace the internal struggle this card represents. You will find yourself at a grand table, laden with food from one end to the other, rich with heavily spiced wine and rich deserts. You glut on these foods, there is never enough, and a deep sickening joy in excess. You feast, and eat, and constantly cast your eye about. Someone may try to take this from you, after all, they are always asking for scraps and food. But what they really want is all, they won’t be stopped at just a little. You speak to another who sits beside you, at his own table. He has brought all of his own food, but you are certain he eyes yours covetously. But that hardly matters, now does it? You both can agree on one thing, all these others, their cries for help and of hunger are a charade. They just want what you have. There is so much conflict in the room as you look about, arguments have no validation, because neither side can come to a conclusion that is equally acceptable. So each struggles, unable to see the other’s side, just as you cannot see their very real hunger. You do not understand why they think your abundance of food to their little is unfair. Come away from this struggle, try to find your way to peace. The world as presented in this Temperance meditation is sick, corrupted, and self-serving. Find your lesson here, and leave before it consumes you. And when you do, record it in your journal, remembering to note how it felt to be that hungry, excessive individual at the table. How it felt to observe the others squabbling amongst themselves. May you never know such a lack of peace.